My aunt and uncle took many pictures during our trip to the Philippines and they put together two awesome videos featuring many of the photographs and videos. The first one is Bohol-Sea and the second one is Bohol-Land. I guess the titles are self-explanatory enough. Enjoy! Other than eating and scuba diving, I enjoyed a relaxing holiday in Bohol with a lot of lounging around at the beach and a bit of sightseeing. I am typically the kind of person who would jam-pack my vacation with activities from dawn to dusk. I am still a little surprised that for an entire day, I did nothing except for walking on the beach, splashing around in the sea, and feeling the ocean breeze on my face while napping in a hammock. Granted, I got myself some ridiculous tan lines to add to my previous collection of skating-related tan lines but it was worth it. Every time I look at that pale rectangular patch of skin on my knee (thank you bandaid) and the pale marking of flipflops on my feet, I am reminded of that lazy day in the sun. I ended my day by enjoying a beautiful sunset by the water. Jumping for joy...and the aftermath. Clumsy me! Photo courtesy of Samson Au. On the second last day of our stay, we booked a car for some sightseeing around Bohol. We visited the Baclayon Church, the oldest coral stone church in the region. 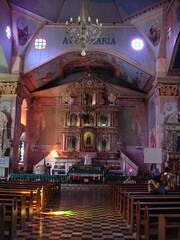 It is one of the oldest in Asia and foremost among the best-preserved Jesuit-built churches in the Philippines. The inside of the church smelled like wet wood and surely I've been to more ornate churches in Europe. However, there was a serenity about this place that made it beautiful in its own unique way. We visited the adjacent museum to look at a lot of artifacts from the church over the years. It was clear that religion plays an important role in the lives of filipinos for centuries. For a more playful destination, our next stop was a petting zoo for tarsiers, the smallest primate in the world. These adorable creatures are nocturnal and they are native to Bohol. The idea of meeting them at a petting zoo did not sit well with me because it is, in a way, a form of exploitation. 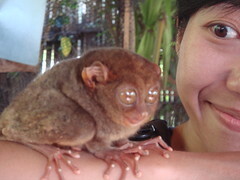 Their keeper offered to place a tarsier on our arms to pose for pictures. The little monkey was so docile and cute though I couldn't help but wonder how would I like to be disturbed from my slumber everyday for the enjoyment of some tourists. Nonetheless, I had my pictures taken with them and they are the cutest little thing. 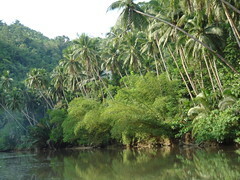 We took a river cruise along the Loboc River. Both sides of the bank were lined with exotic tropical plants, palm trees, and coconut trees. As the river was not very wide, I felt like the vegetation threatens to swallow the river given enough time. The captain of our boat informed us that the water was especially murky because of recent heavy rainfalls. Sitting in that rickety little boat, I could almost see scenes of Hollywood movies taking place deep in the tropic jungle. Our last stop of the day was the famous Chocolate Hills. It is certainly a fanciful name but the "chocolate" in question actually refers to the unique shape of these hills...like hundreds of mounds of chocolate lying in the field. The original plan was to watch the sunset. Uncle S told me that it was amazing to behold as all the colour drain from the hills and turn them brown (hence chocolate!). Unfortunately, our luck with the weather finally ran out and we could see the storm clouds approaching with menace not too far from us. I was a little disappointed that I missed the famous sunset. However, if you ask me, I say the rolling black clouds and that occasional lightning looked even more exciting. After a couple of days in Hong Kong, I left for a tropical scuba diving vacation at Bohol, Philippines with Aunt M and Uncle S. You can read about my experience with learn-to-dive here. Although there is some filipino population in Toronto, my exposure to their cuisine was limited to groceries and baked goods I saw at asian supermarkets. The prospect of tasting some local delicacies during this trip was very exciting to me. Our first stop was a brief layover at the Manila Airport and I wasted no time in getting that first taste of filipino snacks. 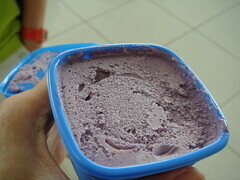 It was [drumroll please] a single serving of Nestle ube ice-cream! I know, I know, so much for being adventurous huh? Okay, it was HOT and I wanted ice-cream (so THERE)! Ube is a starchy purple yam with very similar flavour as taro and it is used extensively in filipino sweets. This speciment from Nestle was nothing to get all excited about. The ube flavour was faint and the ice-cream wasn't even very creamy. However, it was a little refreshing snack to announce the beginning of my vacation. Our first dinner at the Bohol Beach Club resort was a barbeque party on the beach. Actually, to be more accurate, it was the hotel's Oktoberfest Beer Party and barbeque food was served. You just knew that drinking was the center of attention when they tried to sell you all-you-can-drink flat rate admission. However, seeing that we would have a whole day of diving the next day, all three of us made a beeline to the barbeque station instead. Besides, we were starving. The long table was stacked with trays of various different raw protein. From what I could remember, there were whole fish, skewers of pork tenderloin, chicken gizzards, drumsticks, lamb, squids...all served with some house-made hot dipping sauce, fresh calamansi, and tidy little prisms of rice wrapped in weaved banana leaves. Everything was grilled on-demand and it was rather nice to see the amber glow of the barbeque on the darkened beach. I enjoyed two skewers of chicken gizzards and a skewer of pork tenderloin. They were a bit under seasoned for my taste a fresh squeeze of calamansi juice brightened things up a tad. Our accomodation included breakfast in the morning at either one of the hotel restaurants, often served buffet-style. 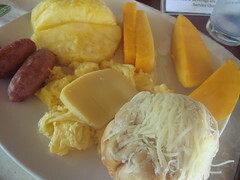 Here is a picture of my typical breakfast selection with plenty of fresh fruit, longanisa, scrambled eggs, and cheese. That blob on the bottom right was an ube-filled ensaymada that I bought the previous night at Goldilocks Bakeshop. The fresh fruit were tropical, obviously. My favourites being mango, pineapple, and papaya in that order. The mangoes were simply AMAZING...so fragrant and so sweet! Longanisa sausages were a bit sweet and salty which reminded me of eating breakfast sausages with maple syrup at typical cabane a sucre in Quebec. They were pretty tasty abeit highly processed. As for the ensaymada...it sure didn't look too glamourous. I've seen plenty of ensaymada in Toronto and I used to think perhaps what we get oversea are a little different to adapt to local expectation. However, now I know that these buns are suppose to look this rustic. The bun was very soft and slightly sweet. I liked the swirls of ube filling lacing the bun but I can't say that I'm a fan of the shredded cheese topping. They just did not taste like cheese to me. 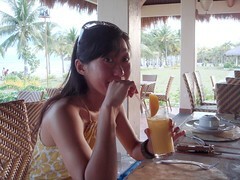 Speaking of mangoes, I totally binged on fresh-squeezed mango juice and mango smoothies during my stay. I visited the Philippines when I was around 8 years ago and the most lasting memory of that trip was the fresh-squeezed mango juice with every breakfast at the resort. Sure mangoes are not longer considered exotic in Toronto and they can be found in many juice stands, restaurants, and malls everywhere. However, there is something very special about the sweetness of tree-ripened mangoes, fruit that has not endured days of travel before reaching The Great White North. I ordered a mango drink with almost every one of my meals and totally indulged in every delicious sip. If you don't already notice, dessert is my passion. How could I pass up the chance to sample some filipino dessert? First up is halo halo. This is a filipino shaved ice sundae with all sorts of yummy add-ons. 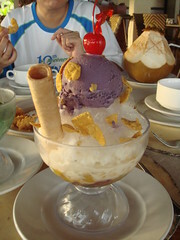 The one featured in the picture had (from the bottom up): assorted boiled beans, young coconut, corn kernels, sugar palm fruit, coconut milk, evaporated milk, shaved ice, corn flakes, wafer roll, ube ice-cream, and a maraschino cherry. How decadent! I once ordered a halo halo from a take out restaurant in Toronto and it was not too memorable. This one, on the other hand, was nothing like that. I particularly like the ube ice-cream used in this confection. It was so creamy and so rich with ube flavour. Poking through the scoop of shaved ice to discover all that goodies underneath was so much fun. This dessert is filling and cooling all at the same time. 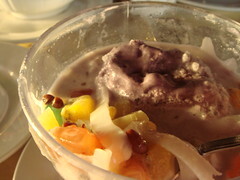 My opinion on halo halo changed much for the better after this particular experience. Another dessert that I tried was buko pandan. Buko means young coconut meat and pandan refers to the screwpine leaves used to flavour the jelly (and give it the characteristic green hue). If you've ever drank nectar from a young coconut, you probably noticed that the inside has gelatinous meat that has yet to harden to what would eventually be used to make shredded coconut and coconut cream. 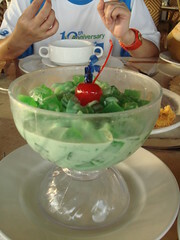 The cubes of pandan jelly combined with the strands of buko all drenched with coconut milk was interesting. As much as I like coconut, this dessrt got boring after a while. It sure looked pretty though. :) For a Boholano specialty, I had to try halayang ube. Don't they look like three scoops of ice-cream? 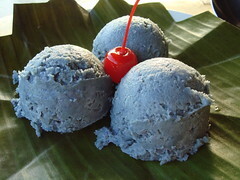 They are actually three scoops of chilled mashed ube lightly sweetened and enriched with coconut milk. I really really like this dessert. It did not taste starchy at all nor did it melt! 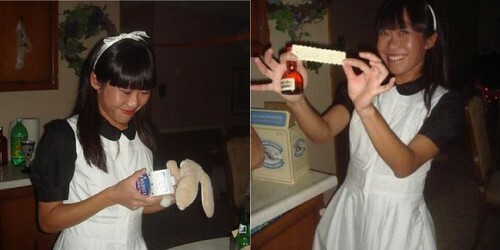 It reminded me of that old tricky food stylists used to make "ice-cream" out of mashed potato for photoshoots. Before we left Philippines, we had another layover at the Manila Airport. This time we went to the staff cafeteria for some not-overpriced-airport-food. Before we even reached the entrance of the cafeteria, I already noticed people walking in the opposit direction with some deep fried pastry in hand. Needless to say, I was curious! 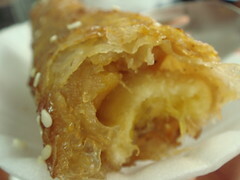 I picked up an order and bit into the pastry to discover a deep-fried banana wrapped with pastry and crunchy/chewy caramel shell. I gobbled it up so quickly...I think there might have been a sliver of mango in there somewhere along side the banana too...It was just so yummy! 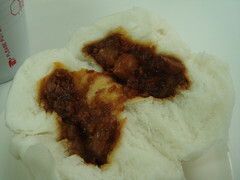 Steamed pork asado buns is another popular filipino street snack. It shares obvious similarities with chinese steamed barbeque pork bun. The filling was more savory than sweet. The bun was very fluffy and soft. I can imagine myself eating this as a quick meal on-the-go. I returned to Happy Valley Race Course for the second time in the last 24 hours for another 5k run. 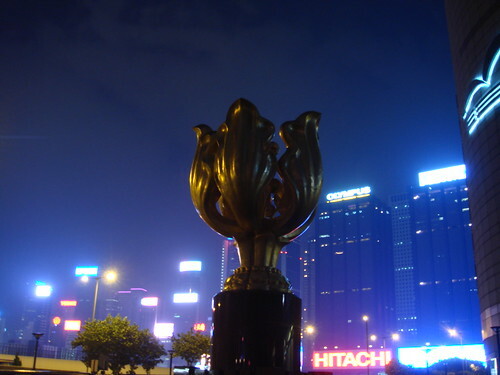 As much as horse racing and the associated betting have a deep connection to Hong Kong society, it has never been something that interest me. Coming to the race course for their football field and running trail is pretty much the only reason that can possibly bring me to this landmark. Mid way through my run, I looked up at the grand stand all around the race course and couldn't help but feel strange how much money and emotion have been shed right there for so many years. 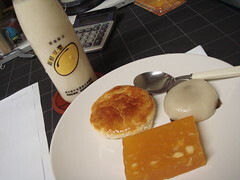 I had a post workout meal of soy milk and traditional chinese pastries. It was nice to enjoy such traditional sweets as wife cake (a flakey pastry with candied winter melon filling), chiuchow tea dumpling (a glutinous rice cake with peanut filling wrapped with a leaf), and water chestnut pudding. The pastries that I bought weren't the best but I enjoyed these traditional snacks nonetheless due to post-workout hunger. 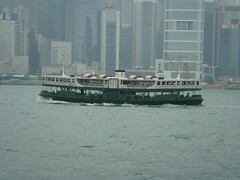 After a bit of a break, I walked over to the Wanchai Ferry Pier for a ferry ride to Tsim Tsa Tsui in Kowloon. This particular route did not exist when I used to live in Tsim Tsa Tsui as a kid...it used to run between Central and Tsim Tsa Tsui. However, with more reclaimed land slowly changing the shore line over the years, the ferry ride across the harbour is now awfully short (someone told me 10min shorter). 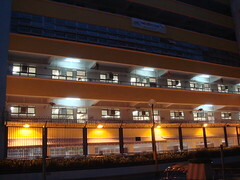 The Star Ferry Pier is a stone-throw away from a complex of high-end shopping centres. I used to know my way in these buildings blindfolded because my home was within walking distance from there. Of course it has been 20 years since I moved so the interior of the shopping centres had gone through facelifts as well. I got lost so many times it was rather embarrassing. 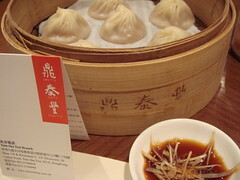 With a few unintentional detours, I finally found 鼎泰豐 Din Tai Fung, the Hong Kong branch of a famous Taiwan restaurant. This restaurant is well-known for their 小籠包 soup-filled pork dumplings and I've been craving them for a while. Since I arrived at an odd hour, there was no line-ups and my meal was a relaxing experience. The service was very attentive down to every little details. There were many things on the menu that interested me but dining alone at any Chinese restaurant is dificult in this regard. Food are in general meant to be shared so I could not really sample as many dishes as I would like. On the bright side, having a whole order of dumplings all to myself is a bit of an indulgence. The dumplings had a thin but pliable wrapping and tidily folded at the top like blossoms. They arrived at just the right temperature so I could enjoy each dumpling without worrying the soup burning my mouth. The soup and filling were sumptious and flavourful. I loved every one of them! For dessert, I had an order of mini taro dumplings which looked exactly like their savory counterpart...until you bit into them. 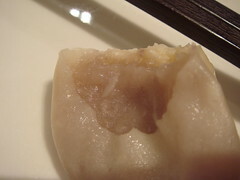 Each dumpling was filled with a smooth filling of lighly sweetened mashed taro. Taro is one of my favourite sweet flavours so I really liked this dessert, well, the first half anyway. Finishing all six dumplings was a bit too much even for my taste so it was really too bad. One thing about all Din Tai Fung restaurants is their semi-open kitchen. There is a huge window between the dining room and the kitchen so that diners can watch the chefs make the dumplings at lightning speed. It was really cool. Once outside of the air-conditioned confines of shopping centres, I was eveloped by the humidity left over from some heavy rain. Canton Road is a major street running along the shore and I soon found myself staring up at the building where I used to live. It was a very strange feeling to recognize so many miniscule familiar detail, things that I did not expect to remember at all. The trees outside of the fire station were still there...we used to pick the leafs to feed the requisit school project silk worms. 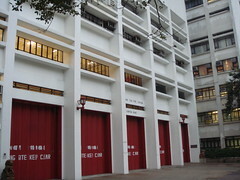 The bright red folding doors for the fire engines garage were just as blinding as before. The gate that blocked the entrance to the apartment...it was just strange to realize so many years have passed since I last called this place home. I looked across the street and my elementary school stared back at me like it used to do. I remember when traffic became too busy, the city built barriers down the middle of the road to prevent pedestrian crossing. Traffic had gotten even crazier since and it would now be plain stupid to jaywalk. I took the long way over to where the traffic light used to be but now pedestrians are forced to cross the street using an underground tunnel. Wow. I must have been very lucky because it happened to be parent-teacher day at the school. The gate that would normally be locked was wide open with a few teachers and the current principal greeting parents and students alike. I walked up to introduced myself as an alumni and they kindly let me browsed through the various trophies and medals decorating the school foyer. I was intrigued and wanted to look for anything with my name on it...I don't know, a feeble validation of me really existed here before? Unfortunately, nothing ancient was on display and I was a little disappointed. I chatted a bit with the principal and interestingly enough, she informed me that the school is trying to get in contact with alumni for next year 50th anniversary celebration. The prospect of meeting childhood friends was not as exciting as I thought it would be. My thoughts were more occupied by the fact that the principal looked about the same age as I am. I left the school without one single photograph with me in there somewhere. I don't know...it's a part of my childhood and it just seemed wrong to put my grown-up self in the picture. Some things are better left untouched. I returned to the busy street and headed towards to the famous Temple Street Night Market. Growing up, I never really knew this area as a night spot until I began watching some Hong Kong movies after moving to Canada. As a matter of fact, I never even knew the Temple Street Night Market is located inside the familiar neighbourhood in my memories. To me, these crowded streets represented memories of following my mom to the market, to the fabric stores, to the subway station. I went to some of the fabric stores and realized my mom probably shopped there many many years ago. I was not wandering around aimlessly, however. I was in search of 澳洲牛奶公司 Australia Dairy Company for their steamed almond egg custards and steamed milk custards. Although this is a somewhat famous eatery in Hong Kong, my reason for visit was entirely nostalgic. The delicate texture and flavour of their steamed custards brought great joy to me as a child when my family would come here occasionally. It never used to be quite as busy and it was just a wonderful neighbourhood spot. I used to share a bowl of "yellow" with either my mom or a bowl of "white" with my brother. Should I pick a hot one or a cold one? Such simple choices...well, I was glad to see that things haven't changed all that much. The menu remained the same and the custards were just as delicious as I remember, which is a fortunate rarity in itself. How many times have you revisit a childhood favourite only to discover it's not as good as you remember? I woke up in the morning without much idea of what I wanted to do. I rarely go on vacation without doing a bit of research but it wasn't so easy when my mind was occupied by New York City. I had a short to-do and an even shorter shopping list. In between all these tasks, I wanted to fill my vacation with sampling local delicacies! Of course Toronto has a vibrant Chinese community and a lot of these local delicacies aren't so unique anymore. However, there is something special about trying the best version that Hong Kong has to offer. Besides, most of these stores for the best-this and the best-that have been around for many many years. Even for the atmosphere, it may be a worthwhile trip. Wanchai is a neighbourhood in Hong Kong full of restaurants old and new. 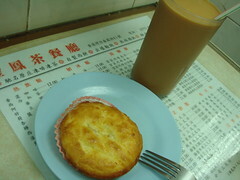 I enjoyed a breakfast of iced milk tea and ham&chicken pie at 金鳳茶餐廳 Kam Fung Restaurant. This restaurant is famous for their iced milk tea and iced coffee. These are staple menu items in most Hong Kong-style cafes but what distinguishes Kam Fung's offering is the lack of ice cubes in the drink so the drinks are not diluted. It was really rich and milky as promised and such a refreshing start to my day! The cafe was tiny and crowded but there is an authenticity about the decor that the new spacious counterparts can't match. I came back to Wanchai after visiting my grandpa in the morning. When Aunt M and I finished shopping for a mobile phone, it was time for lunch. The crowd was thick on the street even though it was a weekday and I couldn't help but think my aimless wandering did not quite fit in. I spotted a takeout counter at the front of 東方小祇園齋菜 Tung Fong Siu Kee Yuen Vegetarian Restaurant and had to stop for a look. Aside from the typical items such as gluten in various sauces and fried soy wrappers, I saw a large selection of puddings in an array of colour. There was black sesame, red bean, crabapple, coconut split peas, water chestnut...wow! 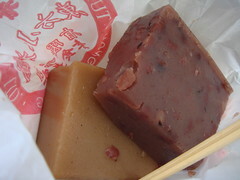 I got myself a slice each of crabapple and red bean and started munching on them on the busy street. I love the tart sweet fruitiness of crabapple while the more substantial taste of red bean was very satisfying. These chilled treats were great in the hot afternoon. A turn here and a turn there, I quickly found myself on unfamiliar streets full of mom-and-pop shops. There was a now-defunct cinema and in the same building, a large yellow sign beckoned. The store front boasted publicity from many magazines and it specializes in clear broth beef briskets. I went into 大利清湯腩 Tai Lee Restaurant with trepidation but the smell was irresistable once I stepped inside. Besides, it was busy with lunch crowd so they must be doing something right. I ordered a bowl of their signature beef briskets in clear broth with some lettuce lining the bottom of the bowl. The pieces of briskets on the very top of the bowl was absolutely delicious. They were not too fatty nor too lean and so flavourful from the long hours cooking in the broth! Unfortunately, as I worked my way down, there were many fatty pieces hiding underneath. :( The broth was also a bit more greasy than I like so it was a little disappointing toward the end. Nonetheless, this was a great treat and would work well with my regular training diet. Too bad I haven't found a comparable version in Toronto. My dinner was one that I had been looking forward to for months. I have very fond memories of dessert buffets in Hong Kong from my childhood years and I read from many sources that the dessert buffet at Tiffin Lounge in the Hong Kong Grand Hyatt Hotel is in a class of its own. It is also one of the longest running dessert buffets in town. The setting was most elegant. The floor to ceiling picture windows overlooking the skyline and Victoria Harbour was breathtaking especially with all the colour lights. The star of the show was dessert of course. It was a feast for the eyes. From the precocious shot glasses of mousses, picture-perfect gateaux, the most luxurious sundae station with silver containers, intricately cut fruit plates, streamlined look of traditional wooden bucket for Chinese desserts, to the double chocolate fountains with little lollipops of marshmallows, madeleines, strawberries, pineapples...choosing your dessert of choice was not an easy task! I took my time to sample as many dessert as I could as you can tell from the slideshow above. :) My favourites were the banana souffle, mandarin orange rice pudding, mango guava stick cake, and marron cream cake (one of their signature desserts). I was surprised that a buffet would even consider serving souffle, a dessert that must be consumed immediately after baking. Tiffin's version was indeed very banana-y and so light and airy. The mandarin orange rice pudding seemed like an unlikely combination but it was harmonious. The floral flavour of guava matched the sweetness of mango and slendar stick cake was an edible trip to the tropics. The marron cream cake...oh the marron cream cake! I grew up on Hong Kong-style chestnut cream cakes and appreciate the differences from tradition French-style chestnut desserts. Tiffin's marron cream cake striked a fine balance between these two style of and it was one of the best dessert of the night. As for the other desserts, I found them a bit ordinary. Sure they looked magnificient but taste-wise, they are not too different from the many bakeries all over the city. After such a decadent dinner, I took a stroll along the harbour to admire the view. The terrace was dotted with couples, photographers, and a few other tourists. It was quiet and certainly a very different side to the surrounding hustle and bustle. Before I left Toronto for my next destination, I was a little worry that the long flight to Hong Kong would be hard to bear to say the least. Fortunately, the segment from Chicago to Hong Kong was an easy 15 hours of mostly slumber because I pulled an all-nighter in a laundry+packing frenzy. By the time I got off the plane, I was fresh and ready to explore the city I used to call home. I met up with Aunt M and Uncle S for a light dinner of pho. Of all my aunts, I'm closest to Aunt M so spending time with them is one of the reasons I wanted to visit Hong Kong on this trip. After dinner, I was on my own to freshen up, settle in, etc. Perhaps it was the effect of jetlag but I felt the pang of hunger around 10 so I decided it was the perfect opportunity to sample some street food. Wandering around Wanchai at night was a bit of an adventure. The last few times I was in Hong Kong, I just hung out with my brother or my mom and let them do the navigating. I suddenly realized that this was actually the very first time I travel in this city by myself. It was a very odd feeling because I had never really been alone in Hong Kong. Somewhat lonely, a bit unfocused, yet full of freedom to explore wherever I wanted to go. I did not have to venture far to find some great treats. My first stop was 檀島咖啡餅店 Honolulu Coffee Shop for their famous egg custard tart in flakey pastry. This is a very typical Hong Kong-style cafe restaurant serving many Chinese/Western fusion food. 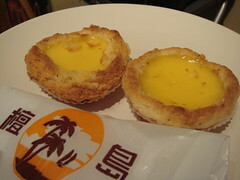 The egg custard tart is a perfect example from this type of cuisine. I stopped at their takeout counter and ordered one tart to go. However, the waitress enthusiastically informed me that it was 2-for-1 sale and insisted that I have two. I guess they must be trying to get rid of as many of their baked goods as possible seeing that it was already getting late. I really only wanted one but I was no match for her insistence so I ended up walking away with two tarts. The flakey pastry shattered in every bite of the warm smooth custard. It was heavenly. I wanted something savory so food on skewers was the obvious choice. 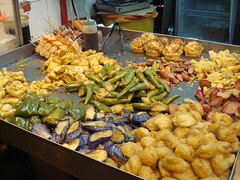 When I was little, such street food was always served from wooden carts by vendors without licenses. Of course the police did not like having the street cluttered by these vendors so every so often, you could see hords of carts racing down every direction of the street with police officers chasing after them...a bit like running of the bulls. LOL Obviously things have changed much since and now these snacks can be purchased at shops typically located in street corners where there are plenty of pedestrian traffic. These are not really food from my childhood memories though so the novelty factor was huge. I ordered a skewer of pig intestines and the vendor deftly dropped it into a wok of bubbling oil. A few minutes later, she fished it out of the wok with a pair of tongs and "plonk" it went into a huge jar of dark sauce sitting in front of me. You see, I was really inexperienced with ordering skewers...and thus picked up the skewer of intestines while the bamboo stick was still WAY too hot to handle. My fingers burnt and everything was dripping with sauce. 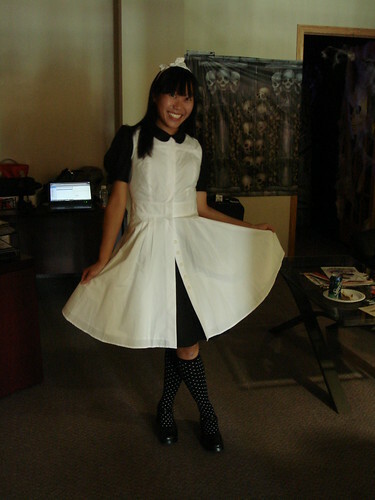 It was as messy as it could possibly be (of course I did not carry any tissues or napkins with me, silly Canadian girl)! I fumbled with it for a while before managing to chow down the fried intestines. It was alright though my experience with the purchase definitely overshadowed the taste for sure. It had been a few years since I last visited Hong Kong and I had been craving for a mixed drink from 許留山 Hui Lau Shan since. I love their various versions of mango mixed drinks but my favourite had to be 雪鴿芒椰爽 Mango Coconut drink with Hasma. It was a mish mash of different sensation with soft diced mangos, splurpy hasma, rich creamy coconut milk, and sweet mango puree. Although there are cafes in Toronto that serve similar food (even sharing the same store name to confuse the diners), it just isn't the same. 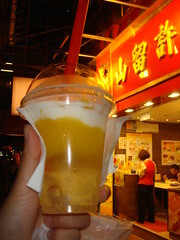 I love walking down the busy streets of Hong Kong while leisurely sipping on a cup of these sweet treats. It is always a great relief to the inevitable heat and humidity in Hong Kong. I took my time strolling back to the apartment and when I returned, my drink was emptied. Definitely a great start to my vacation. 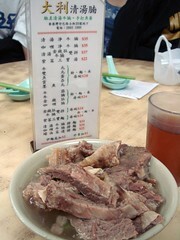 To see where I went for various food in Hong Kong, check out my Google Map.